Ppted has released the new Random Ribbons PowerPoint templates collection that provides you with five new Theme and template design sets. You also get the actual backgrounds so that you can use the same designs elsewhere. 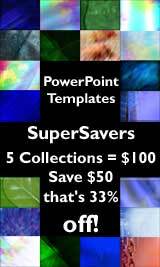 In this collection, you also get wide screen Themes, templates and backgrounds, and ten transparent PNGs you can use in your presentations -- at no extra cost. All Themes are compatible with the newest PowerPoint versions (2007, 2008, 2010, 2011, or newer) and all templates can be used with older PowerPoint versions (2004, 2003, 2002, 2001, and older).